Bring a pot of lightly walted water to boil and cook lasagna noodles until al dente. Drain noodles and wash with cold water. Set aside. Make the bechamel sauce according to instructions. Set aside. In a sauce pan, melt butter and sautee onions and garlic until tender. Add bechamel sauce and continue to cook until it boils. Add 3 cups mozzarella, 1/2 cup parmesan and season to taste. Once cheese is melted and sauce fully blended, remove from heat. On a 9x13 baking dish, pour 1/3 of the sauce. Then arrange a layer using 1/3 of the lasagna noodles. Spread all of the cubed chicken. 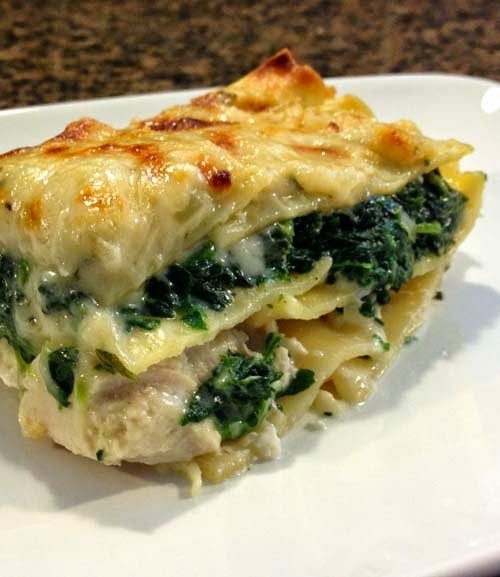 Place a second layer of lasagna noodles (1/3) over chicken. Spread all of the spinach on top of the second lasagna layer as well as pouring evenly 1/3 of the sauce. On top of the spinach, spread the last 2 cups of mozarella and last 1/2 cup of parmesan. Finally, layer the remaining noodles to cover top of and pour all of the remaining sauce. Put in oven and bake for 40 minutes. Let cool before serving.